Follow the instruction below in order to claim your loyalty bonus. · Once during each first week of each month. Only top-ups made on or after the 1st of each month and within the first 7 days qualify. • Bonus credit must be claimed within 72 hours of the qualifying deposit. • This bonus may be claimed only once per user. • Promotion ends 11:59 p.m. at the end of each month. Bets made with bonus credit must be on odds of 1.50 or greater. • Your entire bonus credit must be turned over at least THREE times before it becomes redeemable for real credit. 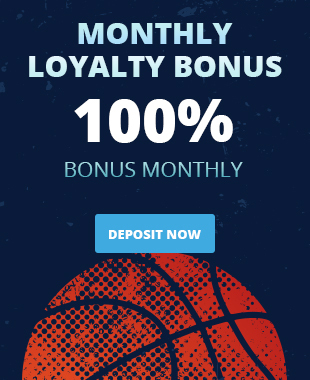 This means if your bonus awarded is $2,500JMD Bonus credit you must settle bets with total stake of $7,500JMD or more. • From the date the bonus was awarded, the user must also have settled bets using real credit with total stake at least equal to the value of their bonus. Bonus credit expires 30 days from the date of award. • You can only have one active bonus at any one time. To claim another bonus the current active bonus must be converted if eligible or forfeited. • This offer cannot be used in conjunction with any other open account offers. • All Island Bet offers are intended for recreational players and Island Bet may in its sole discretion limit the eligibility of customers to participate in all or part of any promotion. Bets placed on Asian Handicap and Goal Line markets, during pre-match will not count towards the turnover requirement stated in condition 4. Where any term of the offer or promotion is breached or there is any evidence of a series of bets placed by a customer or group of customers, which due to a deposit bonus, enhanced payments, free bets, risk free bets or any other promotional offer results in guaranteed customer profits irrespective of the outcome, whether individually or as part of a group, Island Bet reserves the right to reclaim the bonus element of such offers and in their absolute discretion either settle bets at the correct odds, void the free and risk free bets or void any bet funded by the deposit bonus. In addition Island Bet reserve the right to levy an administration charge on the customer up to the value of the deposit bonus, free bet, risk free bet or additional payment to cover administrative costs. We further reserve the right to ask any customer to provide sufficient documentation for us to be satisfied in our absolute discretion as to the customer´s identity prior to us crediting any bonus, free bet, risk free bet or offer to their account. All Island Bet offers are intended for recreational players and Island Bet may in its sole discretion limit the eligibility of customers to participate in all or part of any promotion. All customer offers are limited to one per person, family, household address, email address, telephone number, same payment account number (e.g. debit or credit card, Paymaster etc), and shared computer, e.g. public library or workplace. We reserve the right to withdraw the availability of any offer or all offers to any customer or group of customers at any time and at our sole and absolute discretion. Offers only apply to customers who have made an actual/real money deposit with Island Bet. Island Bet reserves the right to amend, cancel, reclaim or refuse any promotion at its own discretion.